Northwest Missouri State won its first ever regional title in program history with a 82-70 win over Central Oklahoma in the South Central Regional final. Gabby Curtis was named the regional’s Most Outstanding Player. Curtis ended up with 21 points and six rebounds. The Bearcats never relinquished the lead in the second half despite the Bronchos (22-10) cutting the lead to just two, three separate times. With 4:35 left and the Bearcats leading 66-64, Northwest went on a 7-0 run to give itself some breathing room with under three minutes to play. 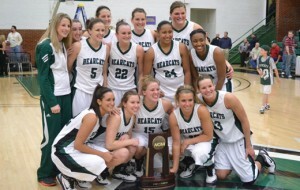 “We made them climb the hill all game long,” said Bearcats’ head coach Gene Steinmeyer. “That’s kind of been our m.o. this postseason, jumping out to an early lead and then not letting teams get the lead back.” Northwest hit 11 free-throws the final 2:03 of the game to help the Bearcats put the game away. The Bearcats will be making their first trip to the “Elite Eight” and won’t need to travel far for their next game which will be played at the campus of Missouri Western at 8:30 p.m. on March 22nd in St. Joseph.